This is basically Scout doing a PowerPoint presentation. He made a really good pitch and grabbed Bigfoot’s attention. Solid work, Scout. You win the account! 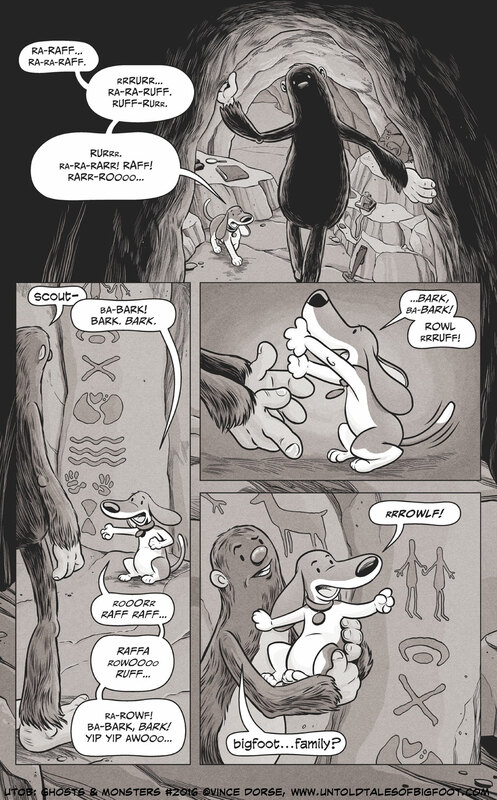 The communication Scout and Bigfoot share is based on some mutually understood words, some body language, empathy, a little bit of magic, and good ol’ fashioned guesswork — the same way any of us communicate with our little animal friends. 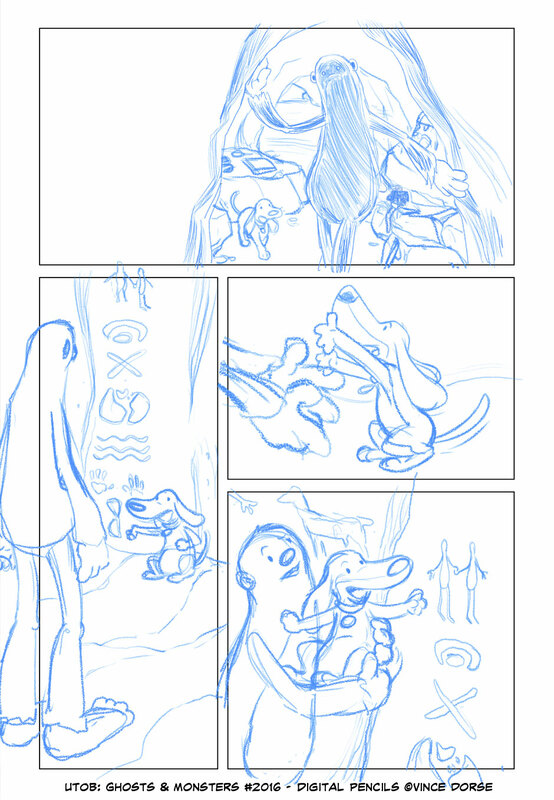 Hey, here’s a quick look at the digital pencils for this week’s page. If these pencils seem like they’re missing something, it’s because the deep shadows of the cave really play an important part in the composition. Still, you get the idea. Hey, just a heads up: This week’s been hectic (likely for you, too), and it’s not gonna lighten up anytime soon. So next Wednesday there won’t be a new page. That’ll give me some time to catch up with my friends and family this holiday (and, probably, catch up on more pages when I can sneak off and work on them). I’ll leave you with this fan art/sketch card I got from Jon Esparza, another comic-maker with his own stable of kid-friendly comics (Mike & Mindy, Bubble Fox, PepperTown). Jon’s one of the nicest guys on Twitter and an unrelenting supporter of this site, constantly sharing and promoting Bigfoot and Scout as if I were paying him — which I’m not (and I won’t, Jon, so don’t get any ideas). But big thanks to him regardless. You can follow Jon on Twitter (where he posts his comics) and check out his blog. Yup, it’s all about family, and you deserve a week off to be with yours! Perfect timing for this episode. Happy Thanksgiving Day, Vince! Thanks for the reminder that Scout isn’t really talking and all Bigfoot hears is bark bark barkity bark! This is tense because I know Bigfoot has some news of his own to deliver. It’s tense!!! Thanks for the process and for posting the great fan art! Those are both always so nice to see. Nice post, Vince! And Happy Thanksgiving!